FAYETTEVILLE, Ark. – The opening game of the NCAA Fayetteville Super Regional between Arkansas and Missouri State on Friday at Baum Stadium will begin at 3:30 p.m. CT on ESPN2, as the gametimes and TV networks for all eight Super Regionals were unveiled by the NCAA on Tuesday morning. The Razorbacks clinched their fifth NCAA Super Regional appearance under head coach Dave Van Horn with a sweep of the NCAA Stillwater Regional last weekend. 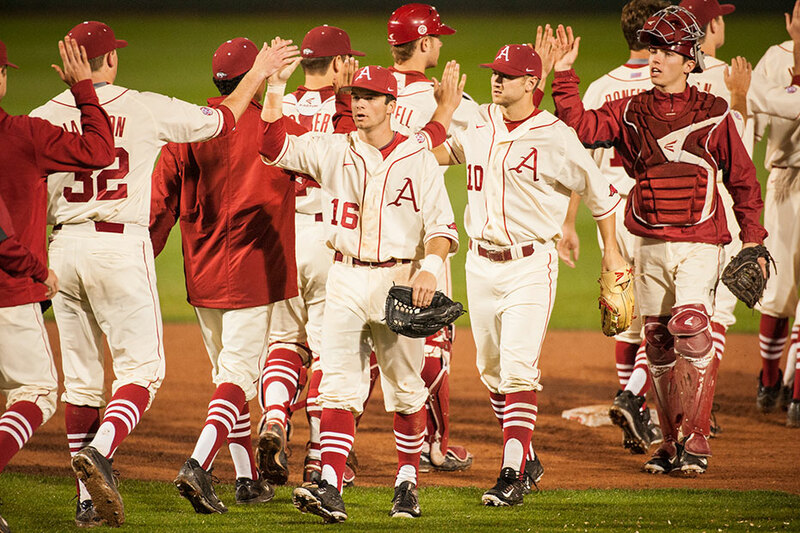 The best-of-three weekend series against Missouri State will mark the second time in program history that Arkansas has hosted an NCAA Super Regional at Baum Stadium. Tickets for the Super Regional are sold out with an allotment of 250 general admission tickets in the Hog Pen reserved exclusively for University of Arkansas students and may be purchased for $15 on Wednesday at the Razorback Ticket Center starting at 8:30 a.m. Students are limited to one ticket per person per game and must purchase the ticket at the Razorback Ticket Center. Students must be present to purchase and show a valid and current UA student ID. With capacity crowd anticipated for the Hog Pen area and in an effort to accommodate as many fans as possible, please note cooler entry may be limited and/or stopped as we approach capacity in order to accommodate all ticketed fans. Per the NCAA, no alcoholic beverages shall be delivered, sold or dispensed for public consumption anywhere in the competition venue, nor shall any such beverages be brought to the site during the championship (i.e., during the period from the time access is available to spectators until all patrons have left the stadium). Coolers and any bags entering the Hog Pen will be searched to ensure compliance with the NCAA’s policy. NCAA policy does allow for alcoholic beverages to be dispensed inside private suites, provided it is not delivered during the championship.